Rockford, Ill. – The Rockford IceHogs, American Hockey League affiliate of the Chicago Blackhawks, announced on Wednesday that single-game tickets for the 2017-18 season will go on sale on Thursday, Sept. 14, at 10 a.m. Tickets will be available through IceHogs.com, by calling (815) 968-5222, or at the BMO Harris Bank Center Box Office. Single-game ticket prices start at $9 and range to $29. Rockford starts their 19th season of professional hockey in the Forest City on the road as they battle the Cleveland Monsters at Quicken Loans Arena on Saturday, Oct. 7 at 6 p.m. The IceHogs then welcome the Rockford faithful to the BMO Harris Bank Center for the first home game of the 2017-18 season against a Central Division foe, the Iowa Wild, on Saturday, Oct. 14 at 6 p.m. The first 4,000 fans in attendance will receive an IceHogs calendar, courtesy of Impact Networking. Key home dates throughout the 2017-18 season also include Military Appreciation Night on Friday, Nov. 24, at 7 p.m. against Iowa, sponsored by Burr Pest Control, Teddy Bear Toss on Saturday, Dec. 2 at 6 p.m. against the Texas Stars and Pink in the Rink on Friday, Jan. 26, at 7 p.m. against the Ontario Reign, presented by Swedish American Hospital. The full promotional schedule will be available later this week. Groups of 15 people or more can receive a discounted rate to any IceHogs home game. IceHogs full and half-season ticket packages and mini-plans for the 2017-18 season are also available, starting as low as $105. Ticket plans with the IceHogs offer many exciting and exclusive benefits which can be viewed here. For more information on group tickets or season ticket plans, call the IceHogs front office at (815) 847-6399 or visit IceHogs.com. 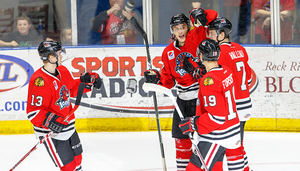 FAS FUEL WINNING WEEKDAYS: After every IceHogs win at home Monday-Wednesday, all fans in attendance can redeem their game ticket for a FREE ticket of equal or lesser value to the next weekday home game. In addition, one lucky fan will win a $50 Fas Fuel/ Fas Mart gift card. BLUES FLAME FRIDAYS PREGAME PARTY: Every Friday night home IceHogs game offers fans the opportunity to enjoy live music, courtesy of the Crossroads Blues Society and Vintage 501. Fans 21 and over are invited to this pregame party which includes live music, free appetizers and exclusive drink specials. Doors leading to the Blue Flame Lounge are located at the upper concourse entrance on Elm St. and will open at 5:15 p.m. before every Friday home game. ME + 3: Fans can purchase three tickets for any IceHogs home game and receive the fourth ticket free. The package is available exclusively online through Ticketmaster.